The use of GPR in construction, inspection and concrete repair has many advantages over older x-ray methods. 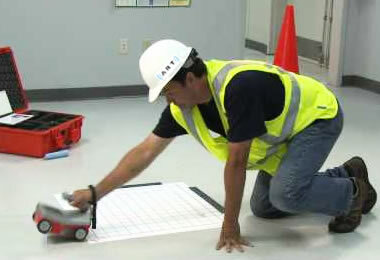 GPR is the safest, fastest and most accurate method of locating reinforcing steel, post tensioned / pretensioned cables, metallic & nonmetallic conduit, and other materials in concrete and masonry structures. With the ability to penetrate up to 18 inches of concrete or masonry, our technicians can map all locations directly on the scanning surface prior to your coring, cutting or drilling operations. 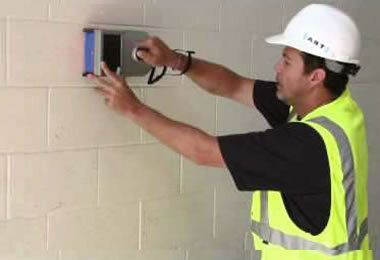 GPR gives real-time on-site results so it takes a fraction of the time of x-ray development and processing. It uses an electromagnetic radar pulse that has no harmful effects. X-ray processes requires a potentially dangerous radiation source and requires evacuation of adjacent areas.